One of the first things we did to the house was add the railing and gingerbread trim. I eventually repainted the floor gray, which didn't hold up well AT ALL. And FINALLY here she is today! It has an inviting, refreshing fun new look! I don't know why I didn't "cutify" this sooner. I have always directed people to my side door because I was so embarrassed of what my mother in law recently called it a "dingy, nasty porch". She was SO right. Now I welcome people to my front door! I already had all these little pieces of furniture and accents before I started this porch so it really didn't cost my anything but the paint. 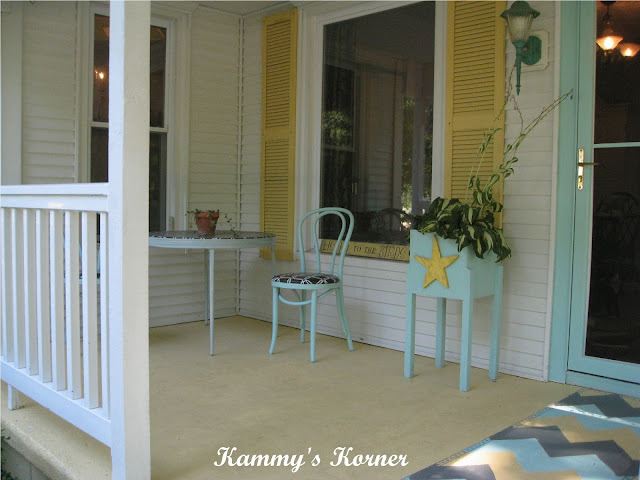 You can click HERE to see how I redid the cute little card table, HERE for the $3 upcycled chairs from Applebees, HERE for the $1 star planter, and HERE for the painted "rug". I just LOVE chilling on the swing. Thanks, Mom, for not wanting that anymore!!! It gets lots of use - it's the perfect spot to read the kids their "before nap" stories. Click HERE to see it's makeover. So this was my dumb blond moment of the project. Oh. My. Word. You know how it is.... the extension ladder was on the other side of the house and I didn't feel like moving it. The truck had my trailor and mowers all hooked up so I didn't feel like getting it out to put the ladder on (which is how I painted the scalloped (fish scale) siding on the front. So I hunted around in the garage and my eyes landed on two empty kitty litter boxes. It just may have worked, but the river rocks in the landscaping made it nearly impossible to keep the buckets sturdy. I still though if I was real careful I could climb to the top. I put the back ladder legs on the porch, and the front ones on the buckets and slowly climbed up. All seemed well until I got to the very top - paint bucket and brush in hand - when it started to tip. Next thing I remember is my head smashing into the pavement. Luckily, I hit several things on the way down so it slowed the fall a little. My rear end had the hugest black bruise and my arm was throbbing. Nothing felt quite as bad as my head though. I lay there on that hot burning pavement for several minutes, wondering if I should have my son call 911... but how embarrassing would that be?! I finally got up, and had a new sympathy for our little kiddos when the fall and get goose eggs on their heads. Unfortunately, I seem to get headaches quite easily since this dumb fall! Oh yeah and as I'm laying there moaning... my four year old is standing over me shaking his finger exclaiming over and over "That's why you shouldn't DO things like that, Mommy!!" Looks amazing...and oh my gosh, what a scary fall! You have a cheerful, happy porch now. Your swing is so inviting. It's inviting me right now. Also, maybe get your head checked. Reread that, sounds funny lol. LOVE what you have done! it is an amazing transformation with just paint and TLC, oh and a few bruises ( I sure hope your ok ). I love the colors you used as well. The painted rug you did is awesome. It is something my drab, yucky porch could use. I always love coming to your blog to see all the fun ideas you have. Ok so next time you decide to do something crazy like that call me and I will come over to supervise while the kids play so that doesn't happen again!!! It looks amazing though! I loved it when I drove by the other day. I'll have to stop and see it in person soon!! Kammy, It looks adorable. 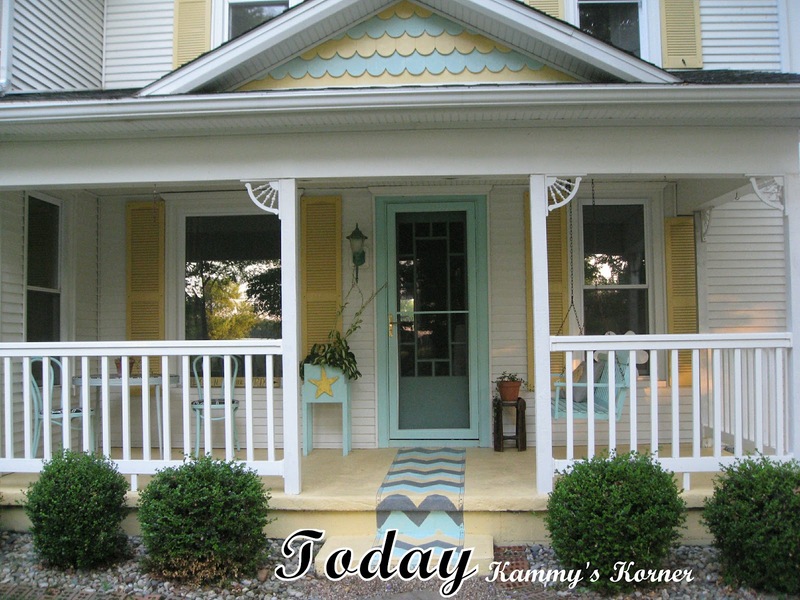 I love the shutters and scalloped siding! Gotta love a four year old! Hope this helps! I have nominated your blog for The Versatile Blogger Award - please go to my site to check out the rules / guidelines. Your porch looks fabulous! I do hope you weren't seriously hurt though. But since pavement is harder than your skull or bones, please don't take any unnecessary risks in your pursuit of beautifying your home. You can't enjoy the porch--or your home & family--if you're laid up in a hospital bed in traction or casts or with a bunch of IVs. Safety first! Ooooh, that had to hurt, Kammy! It looks lovely and a wonderful greeting for visitors to your home. You did real good just having to buy paint. Putting the edge on the rug is exactly what was needed. The entire project is a beauty. It looks great, Kammy! Just might have to make a trip to your porch! LOVE THE HOUSE COLORS , JUST MAKES THE HOUSE HAVE PERSONALITY! Amazing...simply amazing. I am always in awe at what you can do with paint! Sure hope your head is feeling better!! Sharing this to Facebook. Love it. I'm telling your mom too so she can also shake her finger at you! This is a great porch. Love it, love it, love it! Very beautifully done,Kammy. A drastic improvement! Great foresight. love it! It looks soooo beautiful!!! You are so brave to climb on such high ladders! Like when you painted the flag on your barn. I would have been shaking like a leaf ;) Oh, the wisdom of 4 year olds, glad you are ok! I LOVE the painted rug. That's one rug that can't get chewed on by a dog, or blow away during a rain. Love everything you did. Well your porch is gorgeous but I'm sorry you injured yourself while working on it! Love the color combo! I have been seeing your porch reveal all over the blog world recently and just had to tell you how much I love it! I think a porch is one of the things I look forward to the most for when I buy a home! So envious of your gorgeous one! I am your newest follower and if you ever have time I would love for you to check out mine! Oh no! I'm glad you're okay! How scary! 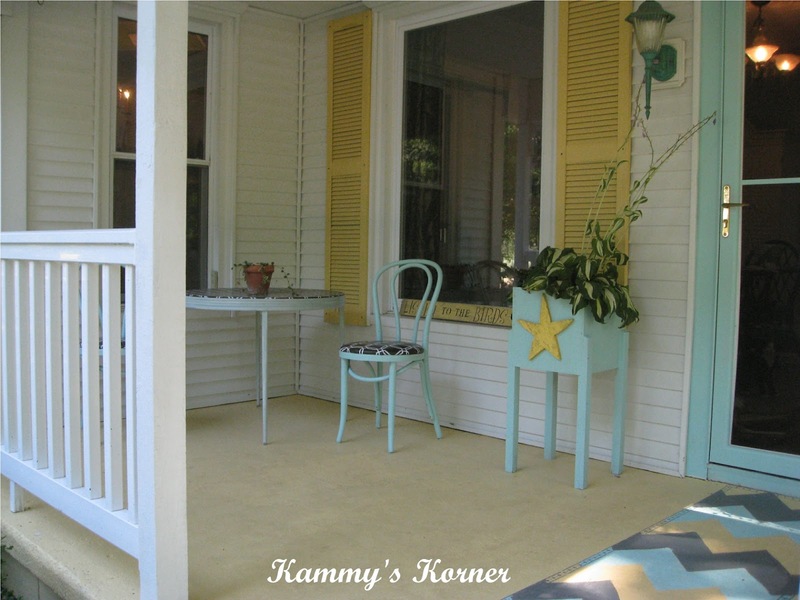 The porch is amazing, Kammy! No longer an eyesore or embarrassment - it's so cute and welcoming! Love it! It looks fantastic! I'm loving the yellow shutters and the door frame trim. It looks so much more welcoming! Hope your head and hiney are better soon. Looks awesome. My porch floor looks exactly like your before picture. Grey and peeling. It's been on the to-do list FOREVER. I need to head out and give it some love like yours! So happy and inviting. Love it. Your porch is awesome, I 'll be featuring it later today. L.O.V.E the transformation! People may have avoided it before but I bet they want to hang out on the porch for hours now...I know I would! It has amazing character & charm! What a darling front porch!!! !